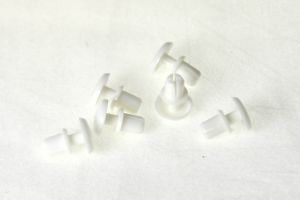 Pack of six two part plastic rivets for fixing Toshiba stirrer covers in place in the roof of the oven. Easy to find and order on your site. It arrived here fast! Appreciate that so my mums old microwave was up and running in no time! Thank you. In fact I needed only 3 so I have some spares. Just what was needed to reattach the splatter guard to the top of my 33 year old Toshiba microwave. Easy to fit and appear to be good quality plastic. Excellent product Saved my microwave which I thought would have to be replaced. Excellent value. They have prolonged the life of my mother's trusted microwave.